Kuragari Mountain Pass is a highway that links Osaka and Nara via Hiraoka. 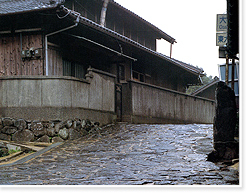 Now known as National Highway 308 and used in such a capacity, its cobbled street still retains the aura of a bygone era when people would walk the path from Osaka towards Nara and Ise. Around the mountain pass, the highway is a part of hiking trails incorporating ancient stone Buddhist images and terraced rice fields. The pass has also become a resting place for hikers with various restaurants and cafes adoring the area.